A low building sits off a side road in Andalusia, Alabama, about as far from any major town as possible. There is little decoration on the outside, no shutters, no shrubs. It’s plain in just about every way. It’s the highest compliment Dean Jacobs hears. 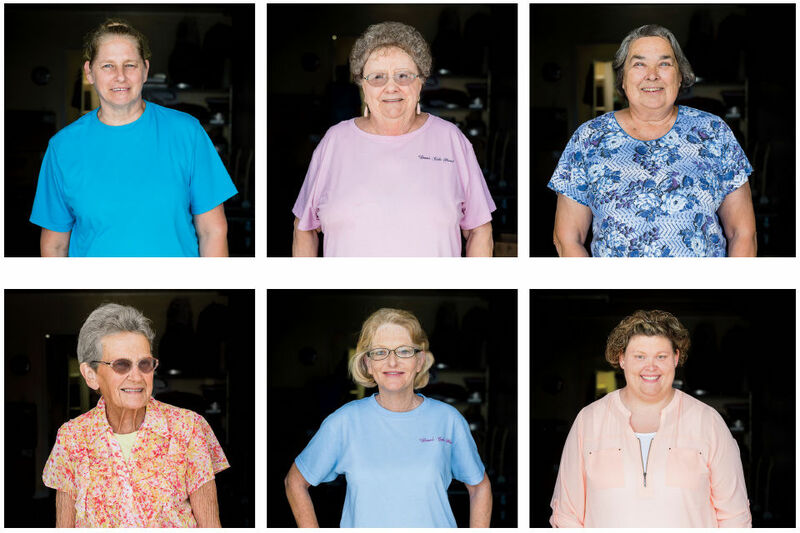 Her bakery is an homage to the Southern grandmother, a testament to the value of doing things the old way. And her secret ingredient is the grandmothers themselves. Past the parlor where visitors can buy cakes, a staff of mostly octogenarian ladies works over a collection of bowls and spoons and icing spatulas. And customers agree. 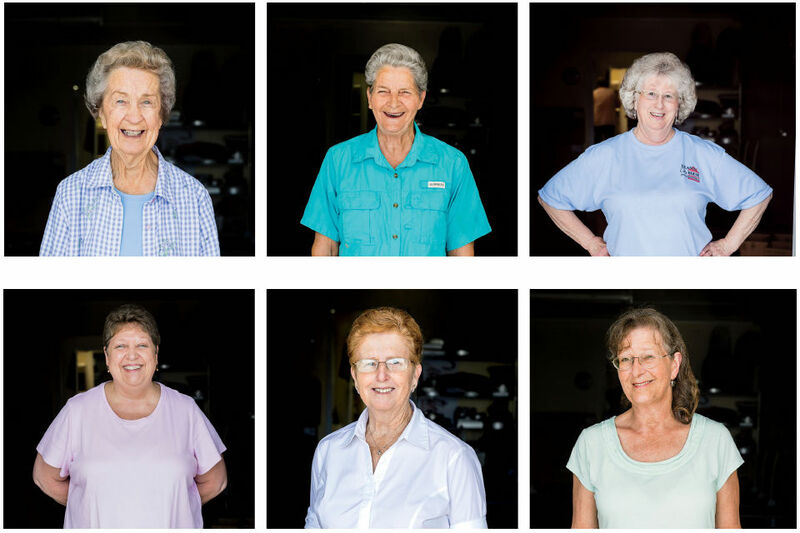 From her nondescript building, Jacobs ships hundreds of cakes a day to grocery stores throughout the Southeast. When the delivery truck pulls up to the back of the bakery, a soft-voiced lady named Bonnie Holley wrestles pallets of cakes out the door. 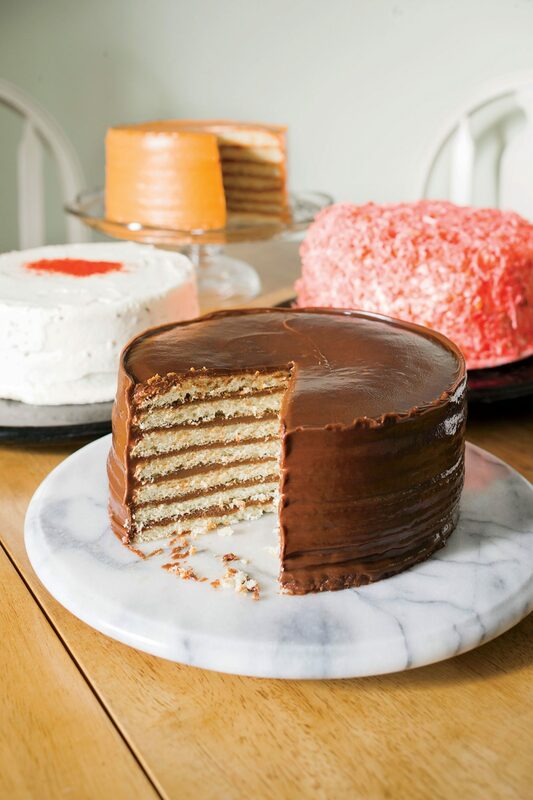 In a world of processed and packaged food, Jacobs’ inefficient, labor-intensive seven-layer cakes have touched something in people that’s more powerful than flavor and texture alone: memories. This part of Alabama isn’t a very romantic place. There are no antebellum mansions, no oak-lined shores. It’s an old railroad town where people work hard, and that suits Dean Jacobs. After the Second World War, her father came home to sharecrop on a farm outside Andalusia. The family was poor and had no automobile, so trips into town were rare, and sweet ingredients were too expensive. As a child, she hardly ever tasted cake. But once or twice a year, on holidays, both of her grandmothers would collect the eggs and flour and butter and set to work. She’s 83 years old now and still remembers the scent of cinnamon and sugar. “They would spend all day on a cake, cooking with those old wood ovens,” she says. She made one cake and then another. Then she sold the grocery store stock she’d been saving for decades and—at age 60—started a new business. 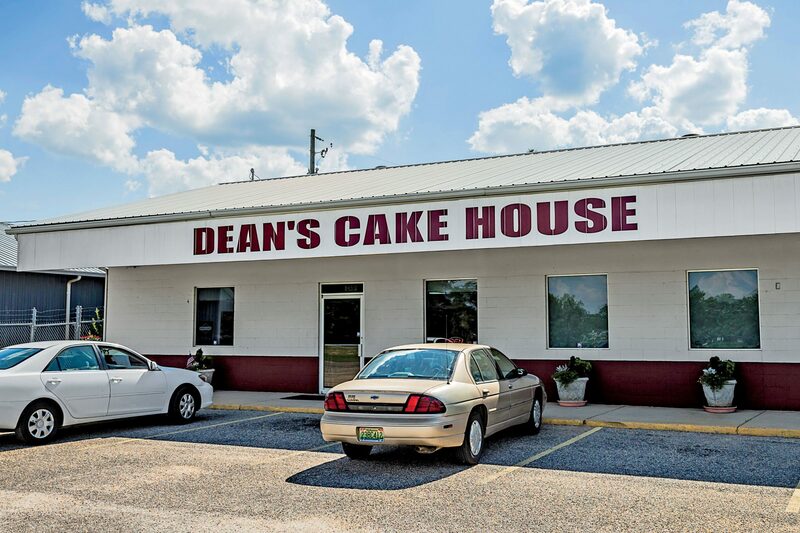 She hired some of the ladies from the grocery, bought a little building south of town, baked more cakes, and then moved to a bigger building. People kept coming. Most were after her chocolate cake, but she expanded the range to include caramel, coconut, lemon, and more. The cakes are all reminiscent of the bakery itself; they appear plain, with little decoration, but are packed with an unexpected sweetness and complexity. 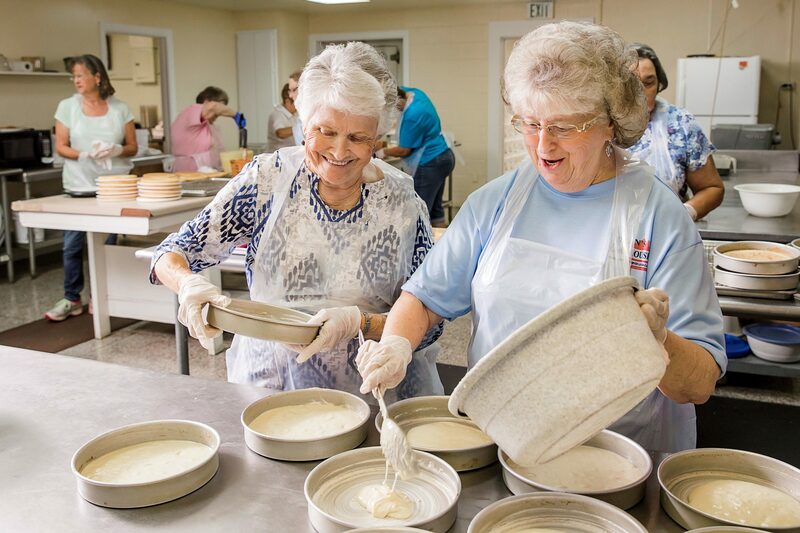 The grandmothers—most of them are now great-grandmothers—whisk and whip, hour after hour, standing flat-footed in their aprons. When Pauline Phillips (who oversees the baking when Jacobs can’t) flips cakes from their hot pans so they can cool, her hands move with the speed of a welterweight boxer. She has worked at Dean’s Cake House for 18 years, and her glorious silver curls test the square-inch pressure rating for her industrial hairnet. The bakery’s most glamorous job is icing the cakes. The ladies stand at small, spinning tables with a stack of thin, cooling cakes at one hand and an enormous bowl of icing at the other. Much like potters throwing porcelain, they construct twirling, towering cakes, layer after layer. Jacobs calls the process “our commotion.” She says corporate types have come through over the years, advising how to make the commotion more efficient. But their ideas led to inferior cakes—like the suggestion that, instead of baking seven individual layers, she should bake one tall layer and then slice it into seven sections. It didn’t work, she says. The raw edges didn’t hold up to the rigors of the kitchen, and—worse—they just didn’t taste right because they absorbed the icing. Someone else suggested that Jacobs replace the ladies with an automated assembly line. She could make a lot more cakes—and money. “And it would taste like a machine!” she says. She stands in the parlor, which features a black-and-white tile floor and a wall of finished cakes, and watches as her staff works. One of the ladies’ husbands recently died, and Jacobs knows the woman will depend on her income at the bakery once she comes back to work. It’s the peril of hiring a staff of women who have baked for generations of children and grandchildren. And then she, a woman well set in her ways, gets back to work.